May you find great value in these inspirational Friendship Quotes from my large datebase of inspiring quotes and sayings. We listen. We listen. We move. We sit. It rains. The sun comes out. We listen. We laugh. We share. We sit. We dance. It rains. We listen. We share. We sit. We dance. There. I stand, a friend. but to one person you may be the world. But friendship is the breathing rose, with sweets in every fold. is like a photograph; with time it fades. of those who are thoroughly persuaded of each other's worth. not when we feel like it, but when they do. but when thou art in, continue firm and constant. for the favor of the kings of the world. A true friendship always feels safe and comfortable. is too good to be believed. 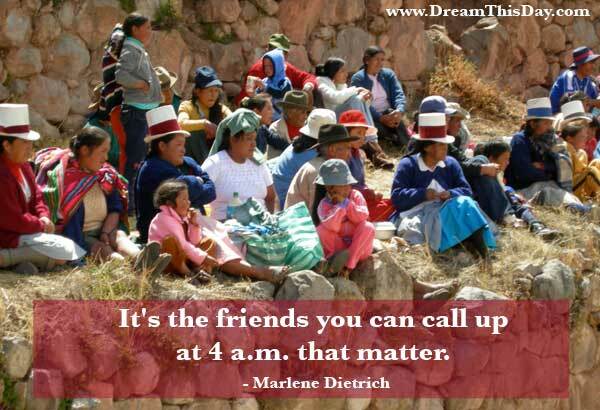 Thank you for visiting these Inspirational Friendship Quotes - Inspirational Quotes about Friendship.